My blogging friend Amy from Mi Savings Mama blogged a few weeks ago about a super cute camisole from SNUG. Keep this in mind because she'll be giving away one for my Made in America event in July! I left a comment telling her how much I needed a new one. Actually, I could use more than one in an array of colors. Well, wouldn't you know it, the rep got hold of me and asked me if I'd like to do a review! Oh boy, you don't have to ask twice. The hardest part was choosing a color. I have several shirts that would be cute with various colors and what girl doesn't need an good selection on any given day. 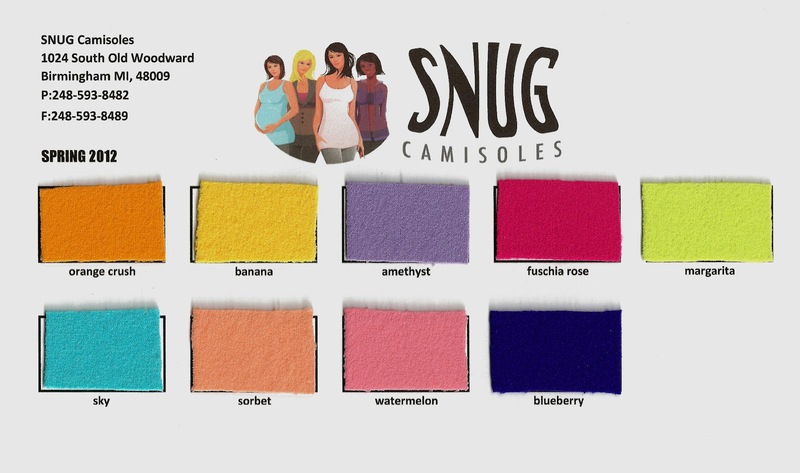 When my SNUG cami arrived, oh. my. gosh. It was like it was meant to fit my body. And that's the awesome thing about their clothing line, it's meant to fit the body it's on! Whether you're petite, average, large, or pregnant, the SNUG camisole was created to fit you comfortably. The thing for me, when I've worn camisoles is they fit me strangely. As soon as they get to my hips, those said hips seem pronounced. Something I could do without. But, even with the SNUG cami fitting my body like a glove, it looked right from shoulders to hips! Thank you, God! A cami that finally looks right on me. The Basic Long Camisole looks great on it's own or underneath any shirt or jacket. Layering it is perfect! Seriously, get a few colors and you're set! SNUG isn't limited to camisoles, either. One of the tops I'm most excited to try out next is the Bra Friendly Tank. You know you're loving the idea of that! Tell me I'm not alone who gets irritated with their bra strap being wider than the spaghetti strap of a tank top? I'd personally like to wear a tank top and not spend my day trying to hide it under the strap. Now, my only problem is, I truly would like several different colors and several different styles. This is absolutely my favorite piece of clothing right now! That means I'm going to have to save every nickle and dime so I can get a new one every so often. Of course, there's always the Sale page. =) What lady doesn't enjoy a sale? When SNUG says it fits "most" they mean it. If you're pregnant, the same cami I'm wearing is one you can wear! This baby stretches like nobody's business! SNUG Camisoles is partnering with Take Steps Metro-Detroit that is walking for a cure for Croh's/colitis. Join the SNUG fam Sat, June 30, 2012 for Take Steps Detroit, as we walk 4 a cure! *I received a cami in exchange for a review. The opinions expressed are my own and never influenced by the company! Those looks awesome! I need more camisoles but I have a, well, chest issue, so I wonder how it would handle the girls, lol. The camis are cool and look nice on you! Great Review! Oh I'd love to try the camisoles! I am in desperate need of some new ones too. Thanks for the review... headed there now! That color looks awesome on you! I am really wanting to try one to see how it would fit over my huge pregger belly right now! Thanks for this great review - now I want one! !